Content: The Belgian goth-rock formation Lovelorn Dolls last year released a successful 2nd full length entitled “ Japanese Robot Invasion”. The songs “The Thrill” and “Happy Valentine” both are some of the finest and most successful cuts of this album so it’s not really a surprise that both songs have been released as EP- title songs as well. “The Original Version” stands for a delicate and poignant goth-rock composition, which is into beauty and melancholia instead of power. The “so-called “Ghost Piano Version by Kristell Lowagie & Maja Marcucci” is even more into melancholia and reverie. As the title clearly indicates, this is a piano written version accompanied by some extra sound layers. It’s an intimate and beautiful version. Remixes were accomplished by Maxx, member of Helalyn Flowers and producer of Lovelorn Dolls, Jean-Marc Lederman (The Weathermen, Ghost & Writer), Simon Carter and the less familiar Restriction 9. 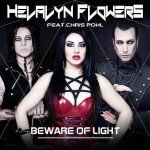 The “Euromance Mix by Helalyn Flowers” is more into electronics and is a real successful adaptation of the original version. Simon Carter adapted the song into a club-minded version, which will be cherished by DJ’s. I expected a bit more out of the other remixes and especially more from the one by Jean-Marc Lederman. The rest of the EP features 7 live versions of songs that were recorded during the legendary, but miserable 2015 edition of “Eurorock”-festival in Belgium. The songs were taken from both debut albums. I can’t get away from the idea that these live songs have been a way to illustrate the power of this band on stage, but the recording of the songs sounds a bit amateur. It all sounds a bit demo-like this way although it might please to the fans of Lovelorn Dolls. You here will get a live version of the title song plus a few more cuts like “The Thrill”, “Japanese Robot Invasion” ao. 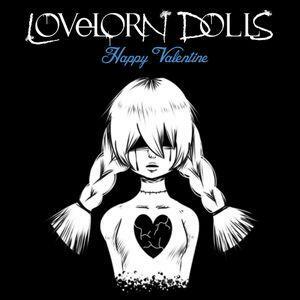 Conclusion: This clearly is an EP with 2 different parts; I like the “Happy Valentine” chapter, but the live songs leave me a bit disappointed. Best songs: “Happy Valentine – Ghost Piano Version by Kristell Lowagie & Maja Marcucci”, “Happy Valentine – Original Version”, “Happy Valentine – Simon Carter’s Clubbed Up Mix”. 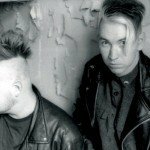 Cult electro act Advanced Art compiled on 'Archive' - grab a copy here!